“Today’s families are so busy, dinner time is often thrown together at the last minute or picked up on the way to somewhere. I love providing busy families with mealtime solutions and giving them more time to sit down as a family or do the things they enjoy!" Some people can hear a song and play it on an instrument  when it comes to food, Tiffany eats something she likes, identifies the ingredients and then creates her own version of it. She loves the challenge of creating something delicious from whatever is in season or on hand. Great food is about combining flavors, textures, colors and creating something appealing. To Tiffany, the next best thing to cooking a meal is knowing that her creation was enjoyed by those who ate it. Tiffany has been cooking as long as she remembers. One of her earliest memories is “helping” her grandmother cook bacon and eggs for her grandfather and then watching him stack the bacon on top of the toast and the eggs on top of the bacon. From there she began practicing in the kitchen, beginning with breakfast in bed for her parents. In high school she recalls offering to help her mom in the kitchen, and then taking over the entire operation within minutes, while her mom sneaked off to do something else. It didn’t take long before Tiffany was in charge of all the meals including holidays and special events. Now friends and family tell her they’d rather have her cook for them than dine out. Tiffany's training ranges from informal lessons from professional chef colleagues to a variety of classes and a lot of practice in the kitchen. 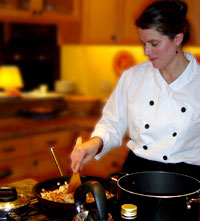 She is a licensed personal chef, certified in both food safety and liquor mixology, and is an active member of the American Personal Chef Association. In addition to cooking, Tiffany enjoys freelance writing, the outdoors and yoga. She is a certified yoga instructor in the viniyoga tradition. She teaches private sessions as well as groups. What a treat it is to spend a weekend practicing yoga and eating healthy gourmet meals!